INKin' All Night! : July SPECIAL offers! Bonus Days coupon codes can be redeemed for any product, excluding Starter Kits and Paper Pumpkin subscriptions. New prepaid Paper Pumpkin codes can be discounted with Bonus Days coupons. 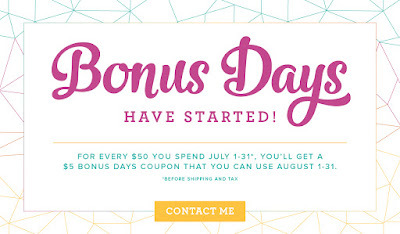 An email address is required to receive Bonus Days Coupon Codes. Ho, ho, ho! Our Christmas in July promotion makes it easier than ever to sign up to be a demonstrator! You, as a new recruit will receive a FREE Essentials Gift Pack including Paper Snips, SNAIL Adhesive, Grid Paper, two D Blocks (one for you and one for a stamping friend! ), and a Bone Folder. That’s an added value of $52 US/$68 CAN! And to give you a taste of the perks of being a demonstrator, SU! will also include the Carols of Christmas Stamp Set from the holiday catalog for FREE ($20 US/$26 CAN)! With so many basic items provided for you, you'll be all set to get started, whether you want to be a personal shopper or a business builder or anything in between — and you then get to spend your $125 of Starter Kit dollars on any thing in the catalog, like stamp sets, inks, paper and more! enjoy FREE SHIPPING on your starter kit too! PLUS the additional $72 Bonus Perks mentioned above, when you join as a SU! demonstrator in July! I'd love to welcome you to my INKin' All Night! team! That's almost a $200 value in product alone for $99!! You can shop in my Online Store anytime! Have a Great Day and a safe and Happy 4th of July!